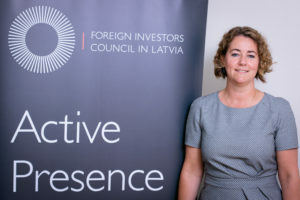 Julia Sundberg, Foreign Investors Council in Latvia chairperson of the board. Rarely now do we need to persuade people that global climate change is a fact. This year’s wonderful, long and uncharacteristically tropical summer on one hand and uneven precipitation and lost crops on the other, are but reminders of the ongoing change. Even though Latvia ratified the UN Framework Convention on Climate Change on 9 February 2017, there has still been hesitation in announcing national targets and long-term measures to limit global warming and ensuring that it does not exceed two degrees. Latvia still lacks a clear vision and targets for the next period from 2021 till 2030, and it is thus essential for the National Energy and Climate Plan sets out targets in a high-quality manner, involving stakeholders and experts in a timely fashion. Investment decisions taken today are the basis for the investments to be executed in the next coming 5 years, which in fact will determine the de-carbonization for the next 40 years. -Tomorrow is the consequence of now. Energy is in transition. CO2-emitting production based on fossil fuels is being phased out giving way to climate friendly renewable energy. Re-modeling the energy system will take effort and need resources. The energy business, as any heavy industrial business, is capital intense. As the chairperson of the board of FICIL, I know many companies that have funds to invest in energy projects, but they are hesitant to do so because of the lack of clarity in Latvia’s energy policy and as we know, uncertainty is one of the biggest obstacles when it comes to inflow of foreign investments. The sooner Latvia defines its energy policy objectives and fundamental principles, the sooner more energy sector investments are likely to be realized. The National Energy and Climate Plan is to be submitted to the European Commission by the end of the year. It will outline the ambitions and targets for the next decade and set the baseline for the framework for sustainable development. ‘Polluters pay’ principle, CO2 emissions to carry costs. Fossil fuels to be taxed in order to promote renewables. Market mechanisms over subsidies to avoid market distorting effects. The best projects are born in competition, therefore the selection process should be through auctions, allowing the project with the lowest subsidy needs to be selected. Promote prosumers and infrastructure load-relieving solutions with producers close to consumers. Electrification of the transport sector. Enhance the legislative environment and reduce barriers for development of large scale wind parks. OIK- to be or not to be? In the last 6 months, there have been many discussions surrounding OIK, expressing diametrically opposite views. The complication is that OIK is a state aid that sets out to support at least three very different matters: renewables, security of supply, and small scale production. As OIK was launched over 10 years ago, there was lack of impact analysis and mechanisms of control. As a result the burden to on the consumers, particularly the energy intense industry, grew to unforeseen levels. The energy intense industry in Latvia has been put at a disadvantage compared to the competition in other European countries. The Government’s decision on the differentiation of OIK, which entered into force only on 1 January 2018, but has been publicly discussed since 2016, has already delivered tangible results in terms of new export markets. Electricity costs include power price, distribution cost and tax (in this case OIK). They are of course an important criteria for investment decisions and within the energy intense sector in particular. The Government has, through the Ministry of Economics, set off resources to come to terms with the abuse of the system. Clarifying criteria for receiving OIK payment and setting up methodology for control and monitoring. The measures could rightfully be criticized for being late, but are nevertheless very important as they not only sort away the rotten apples from the basket, but also legitimate the companies that play fair and contribute to sustainable Latvian society. In terms of sustainability, it is important to support development of renewable energy resources and thus achieve the objectives and targets set by Latvia (current and future). The OIK, as state aid, has been approved by the European Commission. Many times it is wrongly described in media as being a measure to promote renewables, but considerably less than half actually goes to promoting renewables and the bigger part supports fossil based production. In the next decade to come, the important areas to promote will be renewables and flexible infrastructure capable of managing and balancing the volatility that renewables such as wind and solar will bring to the system. These are areas we hope to see be addressed in the National Energy and Climate Plan. Long term investments rely on stability and predictability. Investment promotion on the ability and will to honor undertaken obligations. It is of utmost importance to ensure consistency and predictability in government decisions. Energy sector investors consider it to be extremely important to have long term targets with stability when it comes to support systems. This should be respected as capital intense investments are long term and need certain guarantees to be undertaken. At this point all efforts must be moved towards the establishment of an effective plan for the next time frame, thus achieving the best and most efficient incentives for building the future. To sum up, the issues relating to the future of the energy policy are crucial for Latvia, as this will affect the economy across all sectors. Bearing in mind our common objective of strengthening Latvia’s competitiveness, FICIL will continue to stand for the best possible conditions for business development in Latvia. However, the consistency of the governments decisions is a very powerful factor that influences decisions of foreign investors. We expect political parties to pay due attention to energy policy and implementation issues in the pre-election as well as post-election period. Vai Latvija var iztikt bez skaidras enerģētikas politikas?